1.wireless bluetooth remote control comes with built-in high definition microphone, hands-free telephone function support, no need to worry missing your calls when riding. 2.Multi compartments backpack design, suitable for storage clothes, digital accessories, bicycle accessories, foods when bike riding, hiking, mountain climbing, etc. 3.Ultra loud sound amplifier, enjoy your music more clearly. 4.Voice prompt when playing and bluetooth connected, it can read the number of a call for you. 5.5200mAH capacity battery, long playback time and can be used as a power bank for your mobile phones and other digital products. 6.TF card support, enjoy the musics from your card whenever and wherever you like. 7.Dazzle light support, offering you a more safe riding at night. •We are the only manufacturer of this speaker backpack.Hands free call when you are driving. Bluetooth connection support mobile phone/PAD products, showed music or talk to each other. • High speed wireless bluetooth 2.1, Aux in and earphone support,automatically apply,it perfectly compatible with iPhones, Androids, iPads, Tablets, MP3 players, etc. • Ergonomic rugged design in the back, features with 360 degree breathable material, relax your pain and massage the muscle. • Night driving safety warning function,dazzle colorful LED light will be on short when you open the control switch. 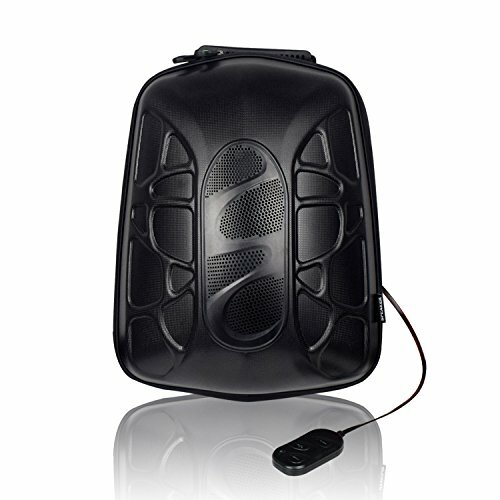 • This backpack speaker comes with 2 built-in bass resonating stereo subwoofer and multi compartments, ideal for outdoor sports like cycling, hiking, mountain climbing, travel, etc. If you have any questions about this product by Wildman, contact us by completing and submitting the form below. If you are looking for a specif part number, please include it with your message.